Typically, the pain will start out mild or intermittent, slowly increasing until pain is continuous and severe, a condition known as chronic neuropathic pain. 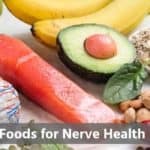 Chronic neuropathic pain is notoriously hard to treat, however there are many natural remedies available that can help. By taking action now, you can ease the pain and discomfort that you are feeling while dramatically slowing the progression of the disease. The goal is to find home remedies that can help you to regain the quality of life that you had before diabetic foot pain surfaced. 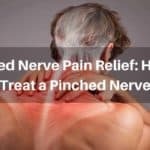 Diabetic nerve pain is a complication that arises due to damage to the axons or myelin of peripheral nerves, which can lead to spontaneous or abnormal nerve activity. The longer that you have diabetes, the more likely you are to experience this type of pain. Preventative measures early on can help to reduce your chances of developing diabetic neuropathy, or help to slow the progression and reverse the symptoms that have already occured. 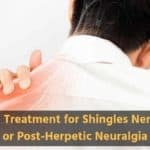 It is thanks to this slow progression that it is of particular importance to pay attention to any signs or symptoms that may be attributed to this condition, and to speak with your doctor if they occur. Common Symptoms: What Does Diabetic Nerve Pain Feel Like? With over 100 different forms of peripheral neuropathy, the symptoms experienced can vary greatly from one person to another. (1) These symptoms are attributed to the damage that has occured to the nerves. Symptoms tend to start out mild, and increase with time unless preventative measures are taken to slow the disease progression. For some, it can become difficult to go about their daily routine, with walking becoming painful or difficult. There are numerous lifestyle changes that you can make and natural supplements or creams that you can take aside from prescription medications to help relieve diabetic foot pain. We will review remedies that you can use to temporarily relieve pain, as well as those that can help you to slowly reverse this pain over time. By using a variety of techniques designed to stop pain now, reverse pain long-term, and slow disease progression, you can begin to take control over your diabetic foot pain. You can find a wide array of topical pain relief creams at your local pharmacy, however there is one natural cream that researchers have found to help block pain signals in those with neuropathic pain: capsaicin cream. (3) Capsaicin is the chemical compound responsible for the spiciness in chilies. In one study, patients were assigned to apply either a normal cream or one with 0.075% capsaicin to painful areas four times daily for 8 weeks. It was found that those who were using the capsaicin cream experienced greater reductions in pain intensity and frequency. There is one downside that you want to be aware of – this cream can cause a burning sensation where it is applied. The severity of this varies from one person and one product to another. 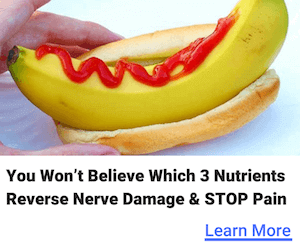 Because of this reaction, it is important to start with a small amount and slowly work up to see where you find pain relief without too much of a burning sensation. Gamma linolenic acid (GLA): As a part of neuronal membranes, GLA has shown efficacy at preserving nerve blood flow. (4) In patients with mild diabetic neuropathy, those who took 480 mg/day GLA for one year were found to have better outcomes than those who were taking a placebo. These benefits were found to include pain relief, improved sensation, enhanced muscle strength, and more. Evening primrose oil (EP) + vitamin E: 500-1,000 mg/day of EP plus 400 mg/day vitamin E taken orally for one year was found to help manage the pain and symptoms of those with mild to moderate diabetic neuropathy. (6) EP is a rich source of healthy fatty acids, while vitamin E is a powerful antioxidant. Omega-3 fatty acids: Pre-clinical studies suggest that omega-3 fatty acid supplementation may help to slow the progression and reverse the symptoms of peripheral neuropathy. (10) Fish oil is the most common omega-3 fatty acid supplement that you will find. 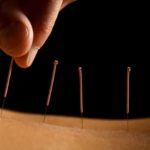 Acupuncture has been an important component of Chinese medicine since ancient times. In this practice, needles are inserted into a person’s skin with the end goal of improving various conditions. These benefits have been found with both aerobic exercises, such as running, swimming, and biking, and resistance training, such as lifting weights or doing body-weight exercises. It is thought that exercise works through a variety of pathways. It is known to reduce inflammation and obesity while helping to improve blood glucose, cholesterol, triglycerides, and blood pressure. It can even encourage nerve regeneration. The idea is this: eat fewer processed foods and more plant foods. The same eating habits that can help you to control diabetes can help to reduce any pain that you feel, including diabetic foot pain. If you want to go all the way, a low-fat plant-based diet has been found to decrease neuropathic pain following 20 weeks when compared to a traditional Western diet. If you are not ready to take that leap, simply eat less fast food, processed food, prepackaged food, meat, and dairy, and add in more vegetables, fruits, nuts, seeds, whole grains, beans, and other plant foods. By making these changes, you are replacing calorically-dense, nutrient-poor foods with nutrient-dense, calorically-low foods. These changes can help to stop the pain at its source, rather than simply reducing the symptoms. While more studies are needed to confirm whether or not meditation is helpful for managing diabetic foot pain, the studies thus far are promising. Nerve damage can lead to an inability to properly feel sensations in your feet, leading to a risk of not noticing if you have a cut, sore, or other problem with your feet. If left untreated, foot injuries can lead to infections, which can eventually result in amputation. In order to protect your feet long-term, you want to protect them with thick socks, slippers, and shoes. You will also want to examine them and clean them daily so that you can identify problems in their infancy. Are There Any Cures for Neuropathy in the Feet? 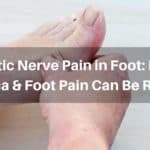 There are no cures for neuropathy in the feet of any type of diabetic neuropathy, however it is possible to slow the progression of the disease and reverse some of the symptoms. Through lifestyle changes, natural remedies, and medications, you can start to relieve diabetic foot pain. One of the most important things that you can do to keep this condition under control is to manage your blood glucose levels. By working with your doctor you can come up with a game plan to manage your diabetes and tackle foot pain. Diabetic foot pain can be a distressing condition, but fortunately there are many home remedies that have been shown to help. Through exercise, a healthy diet, addition of supplements, and working with your doctor to control your blood sugar, you can ease your pain and protect yourself from more pain in the future.